Keeping your caravan clean can be difficult. Whether you’re taking a solo road trip around Australia or you’re caravanning with kids, even the most organised travellers can struggle to stay on top of the mess. While you might start your journey with the best intentions, eventually, your caravan will need a thorough cleaning. That’s why we’ve put together this list of 6 helpful caravan cleaning tips. Covering everything from what equipment to use to how to clean those hard-to-reach nooks and crannies, these caravan cleaning tips will help you keep your caravan neat, tidy, and mess-free! It might seem obvious, but cleaning your caravan is a lot easier if you can minimise mess in the first place. Prevention is better than cure, after all. As such, organising your caravan is our number one caravan cleaning tip. This starts with pre-packing your caravan as much as possible. Buy spare sets of essential items which can permanently live in your caravan, such as knives and forks, toiletries, plates, bedding, games, and furniture. This will save you from constantly moving these items back and forth between your house and your caravan before every trip. By keeping these essentials in one, consistent place, you can save yourself a lot of the hassle – and mess – that comes with packing. 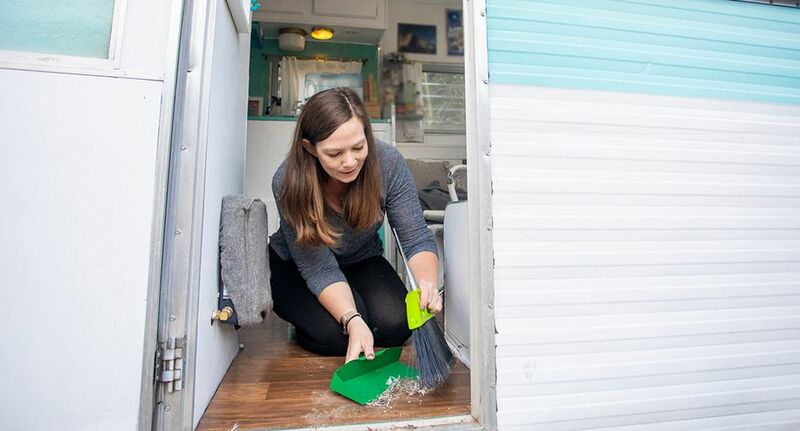 Other mess-saving caravan cleaning tips include keeping a dirty clothes bag, using a hose reel to organise your extension cords, buying hooks and hangers to make the most of ceiling storage space, and buying collapsible items such as furniture, tables, shoe racks, and laundry hampers. Perhaps most importantly, though, don’t over-pack! Being organised is one thing, but organisation won’t prevent mess forever. Eventually, your caravan will need to be cleaned. That’s why having the right cleaning equipment is essential. Firstly, never clean your caravan with a pressure washer. This is an all-too-common mistake. A pressure washer can damage your caravan’s seals, which can cause leaks and cost you in the long-run. Rather, use a garden hose with an adjustable nozzle. Other essential caravan cleaning equipment includes an extendable brush to help you clean ceilings and other hard-to-reach areas (more on that later). Alternatively, you can make your own by attaching a soft bristle brush to a broom handle. You will also need cleaning detergent – preferably a high-quality specialist caravan cleaning product – plus two large buckets, a ladder so you can clean the roof, several microfibre cleaning cloths, a vacuum cleaner, sponges, window cleaner, and caravan polish. Now that you have all the right equipment, it’s time to start cleaning. We recommend starting at the top (i.e. the roof) and working your way down. This is because the dirty water and other run-off from cleaning the roof are likely to mess up other areas of the caravan. There’s nothing more annoying than cleaning your caravan, only for run-off from the roof to spread dirt everywhere. As such, it is more efficient to clean the roof first, then work your way down. Be careful when cleaning the roof – especially if soapy water is involved. It’s always best to ask a friend to hold your step ladder, and take extra care to avoid any nasty accidents. Once the roof is nice and clean, you can work your way methodically down, cleaning the rest of the caravan with caravan cleaning detergent, a hose, and microfibre cloths. If your car is next up on your cleaning list, be sure to check out our seven helpful tips for washing your car at home. Your caravan is a home away from home. So, when it comes to cleaning, it’s important to treat your caravan like your home! This is particularly true after a long road trip. Accordingly, it pays to vacuum the floors, dust all surfaces, clean the shower and toilets, wipe all benches and cupboards, and clear out the fridge. Additionally, pay special attention to the caravan’s windows and mirrors. For beautiful, streak-free glass, use a good-quality window cleaner, some paper towels, and a whole lot of elbow grease. Home sweet home! You’ve washed your caravan, top to bottom, inside and out. Job done, right? Not so fast. It’s easy to make a caravan look clean to the naked eye, but is it really clean? Most caravans have heaps of secret nooks, crannies, and hard-to-reach areas, which are often overlooked come cleaning time. Take a step back, and ask yourself if there are any areas you missed, couldn’t reach, or just flat out avoided? Commonly neglected areas include underneath the caravan, inside cupboards, behind furniture, and out-of-reach areas on the ceiling. Admittedly, some of these areas can be tricky to clean, but trust us, it’s better than letting the mess accumulate, and it’ll be worth it when you’re sitting back, admiring your sparkling, clean caravan! Your caravan is clean. Now, it’s time to add the finishing touches. Polishing your caravan is the cherry on top of all your hard work. To properly polish your caravan, you need to remove any residual wax or contaminants (such as tree sap or bird droppings) with a washing liquid. Ideally, this will have already been taken care of when you washed the caravan. You also need to dry the caravan thoroughly before you begin polishing. From there, polishing your caravan isn’t rocket science. Invest in a good quality caravan polish/wax, grab a large microfibre cloth, and apply the polish/wax to the caravan. By the time you’re done, you’ll be able to see your reflection in the caravan’s shiny surface! For more helpful caravanning tips, check out our guide to buying a caravan for the first time.